Here at One Board Family, we want you to play games together and have a great time. More and more, those games are making an appearance in a digital format. We want to make sure you can make an informed decision before you buy a game in a box or from the App Store. So we’re happy to bring you another board game app review. Carcassonne is very similar to my last review subject, Ticket to Ride, with regard to its place in the board gaming world. It was a huge hit upon its release in 2000, and now there are tons of expansions and different versions that you can get your hands on. Carcassonne is, at its heart, a tile laying game with several different ways to score points. It has a nice mix of luck, strategy, and player interaction to make it a good choice for many game nights. The app brings in all of the elements you would expect. There are some single and multiplayer options, including the ever-coveted ‘pass and play’. You also can purchase some of the expansions, though they’re a little pricey for my liking. However, they kindly throw in the river tiles in the initial purchase, which have become the way in which the standard games start. The overall theme of these menus and navigation is somewhat lacking, but that might be simply because I compared it to TtR’s artwork, which is great. Gameplay works as you would expect if you know the rules of the game. On your turn, you “draw” tiles (the computer randomly generates one for you) and add them to the board where they fit. Cities must line up with cities, roads must line up with roads, etc. You then place your meeple on the tile in order to score points. Whenever a particular point scoring item is complete (a city, a road, a monastery), the points you received are highlighted and your meeple goes back into your collection. The game continues until all tiles have been played. Final scoring is completed, and whoever has the most points wins! The interface is clean and effective. The information that you need is there, plus some little extras. One of the buttons in the lower right corner allows you to look at the list of all the tiles from the game and see how many are left of each type. This can be really useful if you want to strategize what your future turns could be, or completely useless if you’re like me and don’t want to think that hard. 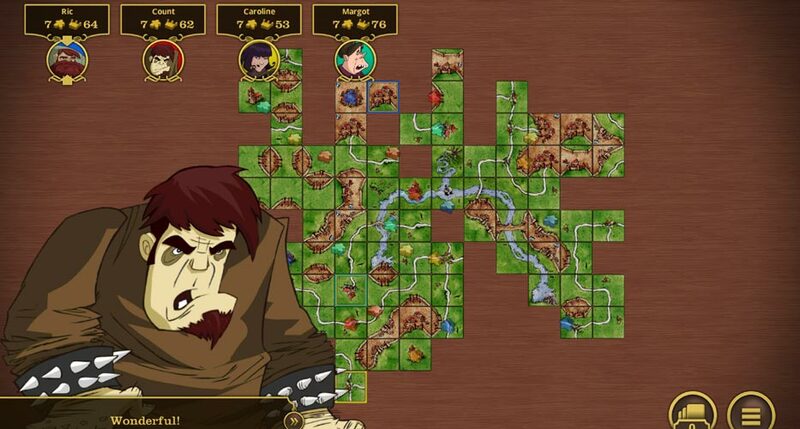 When you are placing tiles, the game will highlight which area of the board will work for your particular tile. This definitely helps move the game along more quickly, as you’re not having to analyze every single spot to figure out what works best on your turn. I like the animation, but it is pretty cheesy. The little sprites showing up to taunt you – whether you’re winning or losing – are entertaining the first time, but quickly grow old. You just want them to go away so you can move on with the game.